Game developers are investing millions of dollars into creating fictional universes which you can be a part of. The development of games like Call of Duty: Modern Warfare 2 and Star Wars: The Old Republic cost more than 200 million dollars each. With so much money invested in video games, it’s fair to say that this is a serious business, which has truly breath-taking products. It’s hard to find the right word to describe how awesome computer games are these days. Not only do they come with all kinds of thrilling gameplays, but their graphics are out of this world. They can really make you feel like you’re really fighting the aliens in outer space or zombies in the post-apocalyptic world on Earth. Unfortunately, not everyone can play these games. First of all, you need to purchase them, but that’s not a big problem. Generally speaking, a computer game costs about 20 dollars on Steam. The real problem is game requirements. Not many regular computers have the hardware strength to run such demanding games. For example, in order to run Mass Effect: Andromeda, which is considered to be one of the best video games released last year, you need a beefy PC. And we’re talking really, really beefy computer, with a really good graphics card just in order to meet the minimum requirements of this game. In order to meet the recommended system requirements of this game, you need a PC with an Intel Core i7-4790 CPU or an AMD CPU with similar performances. On top of that, you also need a powerful graphics card. Two that come to mind are AMD RX 480 4GB and NVIDIA GTX 1060 3GB. Obviously, not many people have a computer with such powerful hardware in their homes, but they should. Why? Because a PC with a powerful setup can be used for playing games, but also for business. The rule of thumb is that if a computer can run a demanding video game, it probably can run a demanding software like Python or Autodesk 3D Studio. 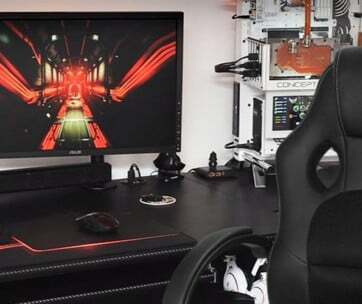 Another reason why it’s a good advice to invest some of your money into buying a powerful PC gaming setup is that the games are going to become even more awesome in the near future. To get ready for them you need a PC with a powerful configuration. If you have no clue about which things make up a good gaming configuration, we’re going to help you out now. Here are some of the computer components you need to pay attention to! Motherboard is the essential part of your PC, as it holds together many other components, including the CPU, memory, and so on. The most important thing to pay attention to when shopping for a motherboard is to make sure it has all the right ports and connectors necessary for connecting other components to it. Furthermore, make sure not to make a beginner’s mistake and buy a motherboard that’s not compatible with other components of your PC and vice versa. For example, an Intel motherboard cannot work with an AMD CPU. CPU stands for central processing unit and is basically the heart of any computer. Without a good CPU, you won’t be able to run a big game, it’s simple as that. So, what are the things you should pay attention to when shopping for a good CPU? First of all, the rule of thumb is that the more cores it has, the better it is. Although it’s true that some two-core CPUs have better performances that quad-core processors, we still recommend playing it safe and going with the one with more cores. You also need to take a look at its clockspeed, as this can be a crucial system requirement for some games. Again, the bigger the better is the rule, but anything above 2.0 GHz should be fine. Another advice that can come useful when shopping for a good CPU is to make sure not to bottleneck other components of your PC. What this basically means is that if one of the PC’s components is much more powerful than the rest, the other will pull it down and decrease its performances. Each graphics card has its own graphics processing unit in order to make the images appear on your screen. Similarly to the CPU, GPU also needs to have a fast clockspeed in order to do a good job. But, that’s not the only specification you should pay attention to, as even if the clockspeed is fast, if there’s not enough memory in the card, it won’t be able to deal with a demanding game. That’s why you need to get yourself a graphics card that has a decent VRAM (video random access memory). The bigger the VRAM, the better the graphics card is at rendering HD graphic features. Apart from the size, you also need to check the speed of the VRAM, that is, its memory bandwidth. RAM stands for random access memory and is one of the crucial parts of any PC. It’s basically the computer’s working memory, which allows it to work with more information at the same time. In turn, a good RAM can improve the performances of a PC significantly. But, what does a good RAM entail? Well, again, the bigger the better is the key. The more memory RAM has, the better effect it’s going to have on your PC’s performances. Luckily, this component is not too expensive, so you can get an 8GB RAM for a pretty reasonable price. But, is 8GB enough for running games? It is sufficient for most current PC games, but the chances are that more-demanding games will start appearing in the near future, so our advice is to go with 16GB. Apart from the memory size, you also need to take a look at its speed. The rule of thumb is that if you see the acronym DDR3 in the RAM’s specs, you’ll know that it’s good to go. And if you want a really fast RAM, go with DDR4. When it comes to the storage unit of your PC, you have two choices before you. The first of is HDD, which has been traditionally used as the primary memory disk in computers for decades. The second is SDD, which is much, much faster. However, the main advantage of HDD’s is that they usually have large capacity. However, in the days of cloud computing, the need of super-large hard drives is diminished. A regular PC user doesn’t need more than 240 GB of memory storage space. But, you’re not a regular PC user; you’re a gamer! And gamers need a lot of memory storage. For example, a game like Battlefield 1 requires you to have at least 50 GB of free storage space on your drive. So, what’s the best solution – sacrificing speed for more memory or vice versa? If money isn’t an issue for you, then getting a high-capacity SDD is the right choice. Unfortunately, these things can be quite costly, so you might wanna think of an alternative. nWe think you need to find the middle ground. You can use both of them! Our advice is to place all the files that you don’t need while playing games on an external HDD. That said, your SDD should be used only for improving your computer’s performances while running a demanding video game. Now that you’ve built the inside of your PC gaming setup, it’s time to deal with peripherals that can take your experience to a whole new level. First off, you need a large monitor! Playing games on a small 17-inch monitor can be fun, but not as fun as playing them on a screen that’s twice the size. Of course, the size isn’t the only specification you should look for when picking the right gaming monitor. You also need to make sure that the display has good resolution. 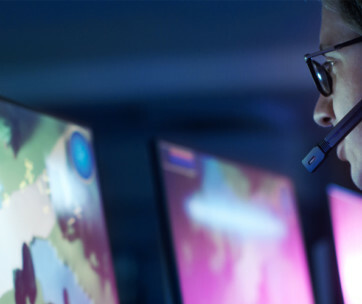 Most of the monitors available on the market today fall in one of these three display resolution categories – Full HD (1080p), 2K (1440p), and 4K (2160). The 4K resolution a.k.a. UHD (ultra-high-definition) is your best choice as it gives you a much higher pixel count than the other two. However, you need to make sure that the graphics unit you have in your PC is actually good enough to keep us with the performances of the monitor. If you’ve picked one that we recommended earlier, you got nothing to worry about! The next thing to watch out for when shopping for a monitor is the refresh rate. It’s basically the measurement for counting the number of times the display can refresh the image in one second. It’s measured in Hz and once again, the rule is the more the better. Most monitors these days have a refresh rate that’s either 60, 120, or 240 Hz. Obviously, our advice is to go with a 240 Hz monitor. The first thing we need to point out is that you want to get yourself a wireless keyboard. Why? Because wireless keyboards are much, much more convenient to use. On top of that, the technology nowadays is such that they’re equally responsive as their wired counterparts. Now that we’ve established that a no-cable keyboard is the way to go, it’s time to discuss the features that make a keyboard deserve your attention. Now it’s time to deal with the type of the keyboard – membrane or mechanical, that is the question. Most budget keypads use a plastic membrane through which electric current runs and sends a signal to the computer each time you press a key. Mechanical keyboards, on the other hand, have a mechanical switch under each keycap. It’s needless to say that mechanical keyboards are much more reliable, but unfortunately, they’re also usually much more expensive than membrane keyboard. Nevertheless, our advice is to get yourself one that uses mechanical switches rather than membranes. After all, such a keyboard will improve your typing speed, not just help you get better in the games you’re playing. Speaking of which, if computer games are the only thing you’re gonna be using your PC, perhaps investing in a good WASD keypad would be the right choice. WASD keypads are specially designed for gamers, which is why they have fewer keys. Usually, these keypads have only those keys that are used for gaming, hence the name WASD. 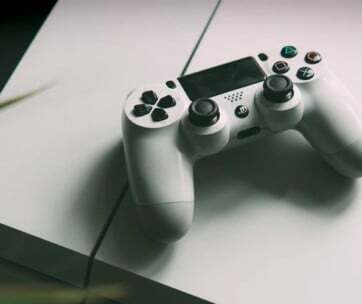 Furthermore, these keypads are ergonomically designed in order to make the games feel as comfortable as possible even after several hours spent playing a game. What kind of mouse you’re gonna get for your PC depends on the purpose you’re planning to use it for. If playing games isn’t the only thing you’re gonna do with your computer, then buying a multi-purpose mouse should be your choice. 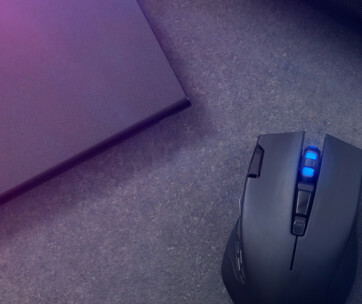 These mice are designed to provide you with decent performances in various different tasks, including browsing the internet, working, and even playing games. If you buy a quality multi-purpose mouse, you probably won’t have any problems using it to play computer games. However, if you really want to take your gaming experience to the next level, then a gaming mouse is what you need. But, which kind of gaming mouse is the best for you depends on what kind of game you’re planning to play. If your choice is a first-person shooter such as Battlefield or Call of Duty, then you need a mouse that’s made for this purpose. 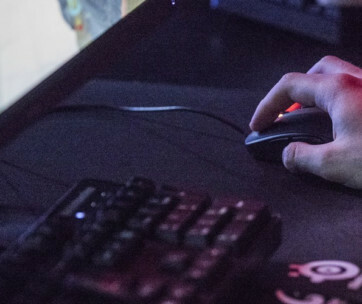 On the other hand, if you’re an aficionado of massively multiplayer online games like WOW or Final Fantasy XIV, you need to get yourself a good MMO mouse. And if real-time strategies are what you plan to play, go with an RTS mouse. Just get a good gaming mouse pad to go with it. It seems that the importance of a gaming headset is not appreciated enough. But, a good headset can give you a real advantage over your adversaries in the virtual world. You will be able to hear them coming long before they realize you’re there. On top of that, a good set of headphones will make you feel comfortable, thus enabling you to play your favorite video game much longer. The problem is that finding the perfect headset for gaming might not be that easy. It’s because it all depends on your preferences. For example, when it comes to the design of the headset, you need to choose between open and closed-back headset. The first one will keep your ears cool and aired, but it won’t stop ambient sounds from interfering with your game. At least not as good as a headset with closed back design would. So, if you share your home with someone who likes making a lot of noise, then it’s better to go with a closed-back headset. But, if your roommate is careful not to disturb you while you’re playing games, then buying an open-air headset is what you should do. Gaming desk is a part of furniture that often gets unnoticed, but its importance is huge. First of all, if you’re a serious gamer, you will have a large monitor. And a large monitor needs a large gaming desk to fit on. On top of that, if a monitor is large, it’s probably also very heavy, meaning that the gaming desk needs to be sturdy and stable. Speaking of stability, it’s actually one of the most important factors to pay attention to when picking the right gaming desk. The reason is that it needs to be able to hold a monitor, keyboard and mouse, and perhaps even a PC. Surely, many desks can carry such weight, but you must remember that you’re likely to pressing those keys on the keyboard hard while playing an exciting game, which can cause the desk to swing around if it’s not stable enough. The final thing you got to consider when shopping for a gaming desk is its design. Our advice is not to get one that stands out too much with its bright color. Otherwise, it would distract you from the game. Instead, our suggestion is to gets yourself a black one. As every experienced gamer knows, an average PC game takes about 5-6 hours to complete. But, some games take much, much more than that. For example, in order to finish a game like Demon’s Souls, you will need to invest over 300 hours into playing it. But, we can bet you won’t be able to finish it if you’re gonna be sitting on an uncomfortable chair. For that reason, buying a good gaming chair is of utmost importance. Ergonomic design is the term you need to remember, as this kind of chair will not only provide cushioning to your bum but will also keep your back in a natural position. There’s really no point of spending hundreds or even thousands of dollars on building the ultimate PC gaming setup if you’re gonna use it to play Tetris. Once you get yourself a powerful gaming machine, you need to push it to the limits by playing some of the most demanding games this world has ever seen. And we guarantee you are gonna get shocked by how awesome modern PC games are! Of course, with a good PC gaming setup, you will also be able to play games that aren’t so demanding. 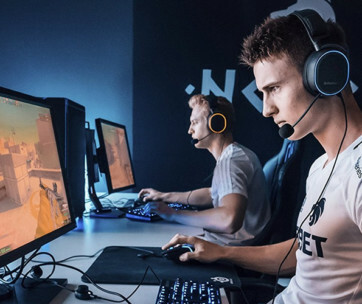 In fact, if you listen to our tips and create a superb gaming setup, you will be able to play literally any game in the world!